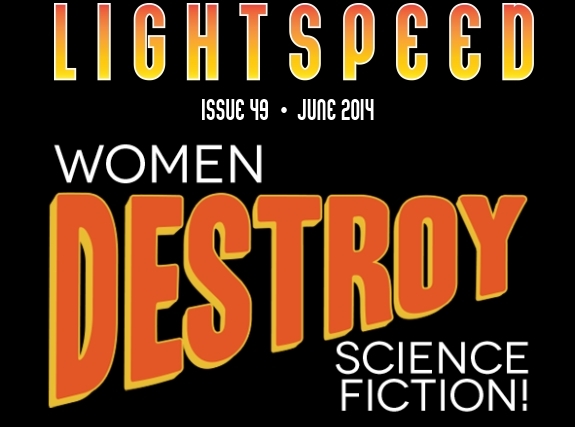 The women are taking over the June issue at Lightspeed Magazine sooo get ready!! I’m over the moon excited that I’m to be included as a narrator in this very special June issue of Lightspeed Magazine. Not only will I be I surrounded by such incredibly talented women, but I also will have the great pleasure of reading a story from one of my favorite authors. I promise to release more info as we get closer, but for now, let me just tell you this entire issue is going to rock! The awesome Assistant Editor of Lightspeed Magazine, Christie Yant, will be taking over the June issue along with the multi talented Audie Award winner, Gabrielle de Cuir of Skyboat Media, who will be producing the podcast. June’s guest host will be Mur Lafferty, former editor of SF audio magazine Escape Pod, and winner of the 2013 John W. Campbell Award for Best New Writer. I am beyond thrilled to be working amongst such amazing company. This entry was posted in Audio Books, Narration, News and tagged lightspeed magazine, science fiction, skyboat media, Susan Hanfield; Carrie Vaughn; Gabrielle Du Cuir. Bookmark the permalink. ← Hello New York! Ender’s Game Alive nominated for the 2014 Audie Awards! !